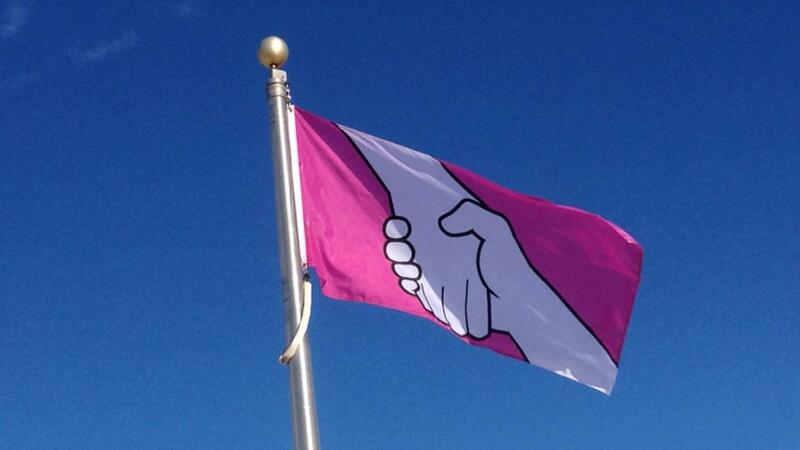 Just in time for Pink Shirt Day on February 26th, Caledonia Regional student Grace Fenton designed the world’s first Pink Flag for Community Anti-bullying Awareness and Support. It was raised in both Hillsborough and Riverview, New Brunswick by the respective mayors. 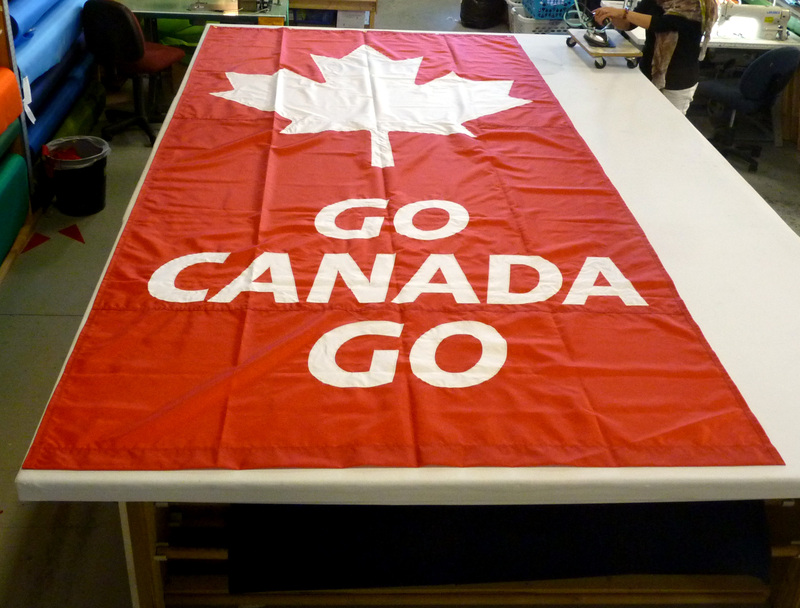 The Flag Shop New Brunswick printed the 33″x72″ flag on 200d nylon and finished with grommets. Twelve flags were printed and are being handed to key people for photo ops with the hopes that the anti-bullying message will gain more traction across the country. Comments Off on Go Canada Go! Both the women’s curling team and the women’s hockey team won gold medals today! Congratulations! In that spirit, we punched up Tom Anderson’s Boxing Beaver flag design. All across Canada, pride flags have been flying in support of LGBT rights as Canada participates in the Sochi Winter Olympics. The cities of Vancouver and Victoria raised their flags on the opening day of the Olympics. The BC Legislature took a little extra time to get theirs up, and The Flag Shop Victoria was integral to that process. NDP MLA Spencer Chandra Herbert wrote to Speaker Linda Reid requesting that the flag be flown at the legislature, and the approval came through on Wednesday. Paul Servos, the owner of The Flag Shop Victoria, got a rush order for a 45″ x 90″ pride flag at 9 a.m. on Thursday. He managed to sew it all together from 200D nylon in the shop in time to deliver it by noon to the Office of Protocol, and the flag was raised around 1 pm. That’s quick service! “In Victoria we enjoy these challenging projects as our smaller sewing room allows us to do customization creatively with excellent value for the customer” – Paul. In addition, tomorrow is The Flag Shop Victoria’s 1 year anniversary of rejoining us! They have done some great projects over the past year. We keep a mix of different examples of our products on hand in our upstairs corporate area to best show what our printers are capable of producing. Some of them are our own designs, some of them are second runs from previous jobs, and sometimes we see art come through that we like so much that we get permission to re-use it. The Vancouver Aquarium has its Up Close exhibit coming up. As part of promoting it, they had blockout mesh banners made for the walkway next to the aquarium. 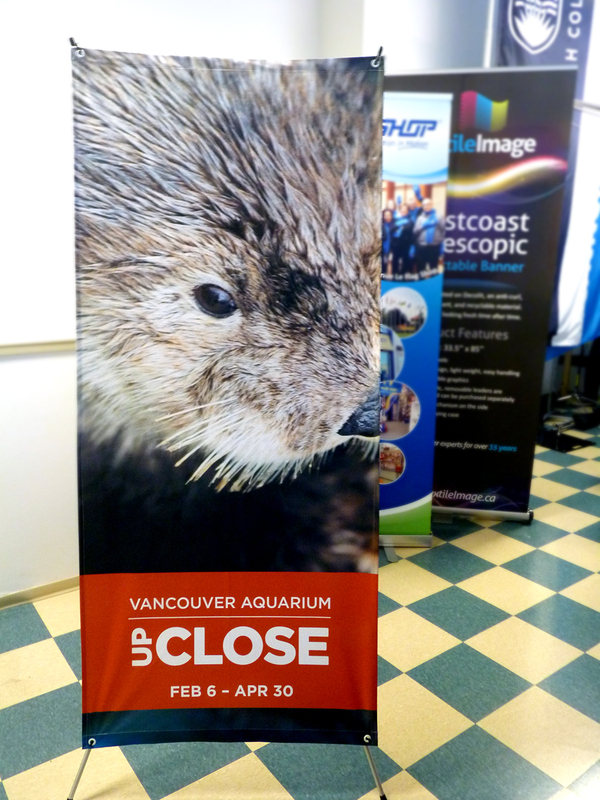 We took that design and printed it on our Coast Display fabric and then attached that to an X Banner stand. Now it’s the first thing you see when you come upstairs! “I did my walk through today and want to extend an extra huge thanks for once again making us look so amazingly good here at the Vancouver Aquarium. You are currently browsing the The Flag Shop Blog blog archives for February, 2014.